The Spirit Diary: Edamame. That is all. Since converting to a plant based diet in early January 2015, I have discovered so many new foods. Instead of craving sugary, sweet snacks I now look forward to eating a variety of vegetables....yes, vegetables! One of my favourite snacks is edamame. 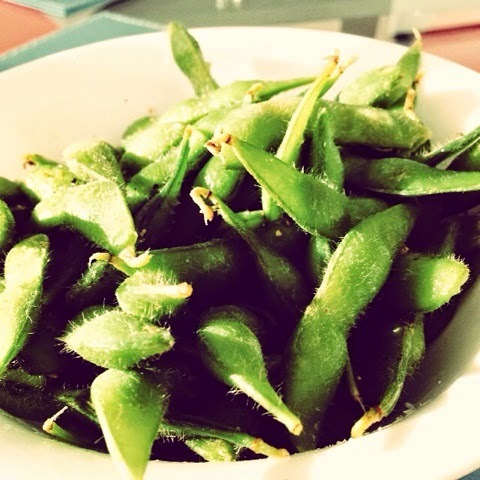 Edamame are soy beans in the pod, usually available as a side dish in any sushi restaurant. Not that I had ever eaten them when we went to get sushi. Now I cannot get enough of them! I buy them at our local supermarket (in the frozen section), throw them in some boiling water for a few minutes. They are already cooked so it's just about warming them through. Then I squeeze fresh lemon or lime juice and add some cracked black pepper. Only the soy beans inside should be eaten as the pods are stringy and tough. They are a favourite for our kids too - such an easy and healthy snack for the whole family. So look out for them next time you are at the supermarket and pick up a bag (or 20).